And that the two key ingredients of leadership are self-confidence and the ability to declare one's point of view. How does one discover one's point of view? John Sweeney: I'll talk first about how we teach our improvisers. We don't try to manufacture a point of view; we try to discover it. Our formula is get empty, get emotional, and then discover it. We think that emotion is a great place for you to discover your point of view, and then secondarily you've got information to feed into it. As an improviser you've got your body – your physicality. If you begin a scene and don't have a point of view, you need to start doing something with your body. Speaking personally, I'll start "physicalizing" something, or become aware of the mimed imaginary environment that I'm in and let that affect me. If someone else starts the scene, I'll absorb the information they've given me. In a business context the information might be a market condition, a brand statement, or an initiative. You need to practice the process of understanding your point of view, and knowing what it is when you have it. You practice having a point of view by having one and declaring it. It's the same as with goals, "You don't know your goals until you write them down." I don't think you know your point of view until you declare it. You can declare it to yourself, or to your coworker. In our training sessions we practice simple things like where we're going to eat tonight. We encourage people to develop a point of view, strongly declare it, and give some specifics, such as "I'm so hungry. I'm in the mood for Italian, and I'd like to go to the Venetian Café." As simple as this sounds how many times, on a daily basis, do we hear in an office cubicle, "Here's what I feel. Here's what I think I want to do, and here's my recommendation for the next steps." It's often so much more vague; sometimes a Norwegian moves in and does the Minnesota Lutheran Verbal Square Dance! As an improviser you can't move forward if you don't declare your point of view in the first 3 to 5 seconds – who you are, what you believe, and what you are trying to accomplish. Without this it becomes two characters on a stage having a conversation like: "Hey, nice to see ya." "Yeah, sure is a lot of weather lately." "Yeah, so, here we are." This type of non-declarative behavior starts an improv scene in molasses, and we can't move forward, let alone at the speed we need to. VB: Isn't the greater issue convincing oneself to have a point of view? John Sweeney: Part of the issue is people take a position that is convenient. Accountability happens right after you have a strong point of view; one way to not be accountable is to be "wishy-washy." If you don't have a strong point of view you don't risk being judged or becoming accountable for actually getting something done. I don't think there are any better examples of non-declarative statements than American politics right before an election occurs. The candidates are trying to expose themselves to as many different voters with different political persuasions as they can. If the politicians were to make a strong point on issues they might split the vote and reduce their share of the ballot pie. They are masterful at talking confidently in an hour-long speech, and never declaring a point of view. When you boil many political speeches to their essence they strongly support all people and promise economic prosperity. VB: A sign in your Workshop's window reads, "Drama Queen's Need Not Apply." Why aren't drama queens an asset in a theatre company? John Sweeney: It's interesting because in theatre obviously we have a lot of drama. What we mean by the sign relates to what we were talking about earlier – selflessness. There are lots of good drama queens who entertain on stage and in movies, but for us it has the negative meaning of "being all about me." It's all about me at the expense or the neglect of the team on stage. In an improv scene drama queens will be inflexible in their point of view and won't play well with others. They'll put themselves before the needs of the acting team. They'll use high drama in their character to grab all the focus. This also applies to the business world. Some people in the workplace behave as if they want it to be more about "me" than the team. More about me than their customers. VB: They are upstaging their peers. John Sweeney: Yeah, offstage it's equally problematic in our comedy theatre because we are a small organization. We should develop a training program that teaches everyone what it's like to work in a low budget, small entrepreneurial organization – we don't have time for drama queens. We are too busy trying to make payroll, exceed our customers' expectations, and treat each other well. We don't have the luxury of spending additional time meeting the ego-driven needs of a drama queen. This is why, tonight at the theatre, if we are short staffed I will clean the bathroom. It's why tomorrow morning if Jenni arrives at the theatre and there's some garbage lying around, she'll clean it up and put it in the dumpster. I love the fact that that kind of entrepreneurial thought process in small organizations mandates that everyone have that type of attitude. VB: How can the improvisational term "follow the follower" be applied to the business world? John Sweeney: "Follow the follower" in improv means there isn't a role for the classic leader. If there was a leader we couldn't spontaneously use all of the points of view in a scene. It would look as if someone was directing the rest of the cast, and that isn't the mathematics of an ensemble-based improvisational team. We practice "follow the follower" so everyone is following and nobody is leading – perhaps it's that everyone's leading and everyone's following. This kind of circular notion means the leader of an improv scene is the scene itself. An improv scene is so short that you don't have the normal type of decision-making process. "Follow the follower" is most applicable in an organization at the beginning of either building a culture or a new process. Anyone in the room at any given time could be the leader, and the rest would follow. In business there is usually one person who has to make the tough decision or series of decisions, and that generally is the person who is the leader. In times of crisis we want someone to step forward and be the leader; it sometimes feels good and safe to follow the leader. VB: "Don't put a lot of pressure on yourself to come up with THE idea; come up with lots of ideas." Why do so many of us loose our innocence and feel that pressure? John Sweeney: The classic reward system in most work places rewards ideas only after they're implemented – and only after they're successful. In this system people are not rewarded for coming up with lots of ideas; the only time they are promoted, get a trip to Maui, or receive a bonus, is after ideas have been refined, implemented and proven to be successful. I haven't encountered many organizations that have a reward system in the first part of the process – for generating lots of ideas. In our organization it takes 6 weeks for a group of 8 people working together to develop an hour and 45 minute script for a show. One of our biggest celebrations is after we hit 600 one-sentence ideas at the beginning of the process. We take the rest of the day off and I buy them beer to recognize that we did it. Good job! We hit 600! Obviously on opening night, when our refined product is implemented and we get lots of laughs, we are rewarded again. In many organizations it seems most people assume they're only going to be rewarded if a new idea or initiative makes it through the difficult screening process, is implemented, and is profitable. This leads to a lot of pressure. If I'm never rewarded for having a "bad idea," it must mean bad, unimplemented, or unprofitable ideas are not helpful, nor are they welcome. Even though employees may have heard their leader or brainstorm facilitator say, "We are trying to come up with a whole bunch of ideas," they think what is meant is, "We're trying to come up with a bunch of perfect ideas." I like the word that you used – "innocence." Not many 4-year olds critique another 4-year old because they choose a wrong color for the imaginary pony they're drawing and coloring. They just appreciate that there's a new idea and it's a fun process. A lot is about perceived and actual rewards. VB: You say, "We've come to understand that, in general, people are more affected by their fear of creating the wrong idea than they are motivated by the excitement and passion of creating a truly innovative idea." How do you think we learn this fear? John Sweeney: In my education, which was a pretty standard American education, at the end of a test or a paper I was usually told what percentage of my responses was wrong. I was graded on a scale that ranked me based on how wrong I was. I was also asked to re-learn those areas I got wrong. Perhaps it wasn't always communicated on the basis of what was wrong, but that's what most of the students in my classes felt. We were always motivated to try and get as many right answers as we could. We were also given the clear message when we were studying the sciences, math, and even English that there was a right and wrong answer. We were in a system of trying to be perfect, and learning "It has to be right or it's not considered." In a math problem you got zero points for the wrong answer. This extended beyond Algebra! In Calculus once in awhile we'd hear from our teachers comments such as, "Your answer on this theorem was 40% correct" but it was the exception to the rule. At least in improvisation the "wrong" thing you say might be interpreted by another teammate as a wonderful insight, which could lead to a cool solution. In our art form we don't have the time for actors to figure out the right answer. We don't have the ability to analyze and strategize; we have to react and not worry about whether we're wrong or right. In the business world there often is no reward for coming up with the wrong answer. That's where fear emerges. Much of what we do with business clients is figure out ways to practice rewarding employees for coming up with "an idea," instead of the "right idea." It's interesting, especially in these times of difficult economics, that we can point to many "right ideas" that didn't turn out. Like the "right idea" to focus on manufacturing lots of gas guzzling SUV's in Detroit. When they retooled the factories and budgeted for that major conversion project, everyone agreed it was the "right idea." Not to get too philosophical, as I believe there is often a right and wrong morally and ethically, but not necessarily with ideas in business. Sometimes all we need is 5 to 10 years to prove that some of those great ideas weren't the "right ideas." Perhaps there aren't as many absolute truths in business as some would like to think. VB: You became "Jiggly Boy" after "performing" in front of about 19,000 fans of the Minnesota Timberwolves at the Target Centre stadium. What did you do to create such a ruckus? John Sweeney: As the youngest of 8 children, that was THE moment where I could look my Mother in the eye and say, "I'm so glad I made you proud." We worked with the creative people in the Minnesota Timberwolves organization, and they kept asking us, "What can we do at our live events to engage our customers a little bit more?" We decided to come up with ideas for creating a "something" that would stir up excitement in the Minnesota basketball audience. Something similar to how Canadians get excited and passionate about hockey. Or Europeans with soccer. I'm from Wisconsin so the Green Bay Packers have that effect on me – I lose my mind! I love going to their football games. In Minnesota, it's more like a Lutheran wake at the basketball games. Not a lot of laughter. Kind of a silent judging. Not the kind of ruckus we hear at most games elsewhere, such as, "We're gonna win! Go get 'em." We needed to come up with something that would stir up the Norwegians. The second challenge was that the Timberwolves organization was having a hard time getting major media coverage, because Minnesota is a bit of a fly-over town. The National Basketball Association coverage in the media is usually about New York, San Antonio, Los Angeles, and other teams in major markets. So the goal was to accomplish two things – get people fired up and get some major press coverage. We jointly came up with about 300 ideas, and at one point in the brainstorming session I asked, "Why do these Minnesotan's act so reserved? Do they think it's against the law to have a good time? Do they think they will be arrested if they show some emotions at a game?" The idea that we implemented was rehearsed at the arena with cameras for about 4 hours so it would come off with perfection. During the game I was planted with the spectators in a general seating area. The arena puts a camera on people in the audience, and they dance while everyone claps. It's broadcast on the JumboTron. We took this to the next level. I am 5' 10" and 265 pounds. I used to look like a football player; now I look more like Jabba the Hutt. The camera was purposely focused on me. I was wearing a Timberwolves jersey, and started dancing – actually I'm quite a good dancer. I ripped my shirt off, and underneath I had the names of all the players in what looked like huge tattoos, albeit they were in rub-off ink. I started dancing like crazy, and a bit more provocatively than you would want a 265 lb. Irish guy to ever dance in public. Then we had two of our actors, dressed in actual security guard uniforms from the arena, come down the stairs, handcuff and take me away – I was obviously having too much fun. The crowd went crazy. They went nuts, they went ballistic because everyone saw it on the large-screen television and it looked realistic and believable. We then had to improvise, because so many in the crowd were very upset – in the 4th quarter the two imposter guards brought me back to my seat with my hands raised, and it was broadcast for all to see. The crowd again went just nuts. I ended up dancing with the dance line girls six more times that year. This is where the phrase "Jiggly Boy" was coined. It will make much more sense, if I can use that term, if you see it on YouTube. It's a video you would never want to watch a second time but many people watch it over and over, because it's so ridiculous – me dancing with my shirt off, 16,000 people going wild, and then my getting arrested! VB: You say in improvisational training students are told "you must make everyone on stage look better than yourself." Is this an important lesson for the corporate world? John Sweeney: It relates to what we talked about – being selfless, and being rewarded for being selfless. In improv if you make everyone look better than yourself, you will look the best on stage. That's such a hard lesson to grasp and follow in the real world. Think of Mother Teresa. She spent her entire life being selfless and caring only for others and yet, in terms of status in this world she was idolized. Many think she was the ultimate human being. She was someone we could all aspire to be, and yet she never did anything to promote herself. She cared only for others, and I use this as an analogy for improv. As an improviser if you work at helping the others on stage – hearing what they need and giving it to them – at the end of the show there'll be a line waiting outside the lobby to tell you, "I've never seen anybody improvise as well as you. You are unbelievable! Man, you are funny!" It may not be possible to do this continually in the corporate world, but why not try? Ask yourself, "Why can't I put others ahead of me all day long?" "Why can't I serve my customer more than thinking about my salary?" "Why can't I promote other people on my team more than my own agenda?" As much as I believe in this approach, I also have to admit it's difficult to do on a daily basis. VB: If, as you say, the ability to deal with constant change is almost a required skill for corporate employment, do we need to fundamentally change the educational system and our definition of work? John Sweeney: That's a big question! At times we're pretty rough critiquing the educational system, but we also need to acknowledge that the current system has many great aspects. My 6-year old son is just beginning that journey; he's in a rather traditional school and I can't imagine him being happier. He has great teachers. His kindergarten teacher has been working with children his age for 30 years, and his 1st grade teacher for 31 years. It's somewhat like the healthcare debate. It suggests there are many things wrong with U.S. healthcare, and I'm sure there is, but my 4-year old cut his finger last week and we only had to wait 20 minutes. The doctor put sutures in his finger, and I walked away from that experience thinking, "We sure are lucky to have such a great healthcare system." I certainly could never say there's a lot wrong with our education system, or our work environments. However, I can make a comparison to the idyllic world of improv. Some of the things in the hierarchal structure in many businesses seem to get in the way of what organizations are asking me to help them with. VB: The Brave New Workshop Comedy Theatre is 57 years old, if one includes its first 7 years operating under the name Instant Theatre Company. As co-owner of the company what legacy do you hope to leave? John Sweeney: It's rather fun to think about this question so close to the night when Dudley Riggs received the lifetime achievement award. Before we decided to buy the theatre, Jenni and I asked ourselves what we wanted to accomplish with it. A camping analogy is we just want to leave the campsite in a little bit better shape than it was when we got there! Everyday we try to take what Dudley started, and throw a little more energy and financial stability at it, but we don't want it to change radically – only to evolve. Philosophically, and Dudley would agree with this, most companies are one big improv scene. The first 39 years Dudley was part of the scene, over the next 12 years Jenni and I have had some influence and made a contribution, and when we are gone it will be the next part of the scene. We believe the current part of the scene is directly related to what came before it, and it'll be directly responsible for what comes after. The Comedy Theatre will continue to evolve and, like Dudley, we hope we are flexible enough, as owners, to accept whatever the next part of the scene is. Who knows what the future holds. In this world of digital imagery, video, and the Internet are people going to go to live theatre like they did in 1958? I think not. Recently I heard an 18-year old say, "I think you do some funny stuff, but I can go to YouTube for free." We always have to be looking at what the next innovation will be. We need to be flexible and welcome change. As far as a legacy, I would love it if Jenni's and my legacy is that we have created an endowment mentality, where we could be assured the improv theatre will exist for a long time into the future – maybe 200 or 300 years. Financially our goal is to create an endowment for the entire institution so that when we leave and someone else takes over, we will know that for the 50 or more years we ran it, it was put on a solid foundation enabling it to continue for another 50 years, no matter what happens. It is an interesting issue, because we are one of the only self-funded arts organizations in the U.S. We don't accept funding grants, and we don't take government funds. We've figured out a way to be entrepreneurial and fund ourselves as an arts organization. That's perhaps our greatest legacy goal. VB: Should we refuse to participate on teams where there are members who are not innovative? John Sweeney: No, because I don't believe there is such a thing as a non-innovative person. Everyone is innovative somewhere in his or her life. People may be in an organization or culture that's not allowing them to be innovative. When I think about this question, I'm reminded that innovation is a self-responsible thing. When I ask people in large organizations why they aren't as innovative as they could be, the easiest answer is, "Because nobody on my team is innovative." If everyone is saying that, then no wonder! My approach is to challenge them to think, "That's the team I want to be on!" In that situation you can be the most innovative person in the group and lead the way. If, in an improv scene, I spend time, even an instant of time, worrying about the level of improvisational skill of my partners, I am no longer contributing to the scene. I've stopped improvising. So we don't operate that way. We simply take care of ourselves, and since we know that everyone is doing so, the ship rises with the tide. In some ways the thought of refusing to participate on a team is a foreign question to me. I'm too busy trying to find the next idea in an improv scene to ever worry about what someone else in the scene is or is not doing. VB: Should training in improvisation be mandatory for all people working in organizations? John Sweeney: I don't know if it should be in improvisation, but certainly some form of liberal arts or exposure to other ideas would be helpful. It could involve looking outside your industry, developing skills in the arts, participating in athletics, or expanding your horizons to something different than the business world. I hope this approach will become an important part of corporate curriculum. In some of the great institutions of higher knowledge, students take core classes and also have to take electives. You can't be a nuclear physicist without taking a philosophy class. You shouldn't be a doctor without taking some business classes. What I like about improvisation classes for business people is they provide a broad range of applicable skills. You'll look at things a bit differently. If you can improvise you can probably sell better, facilitate a team better, and do engineering work better. You certainly will be able to market better because you will learn how to get to know your scene partner, which is your customer. Another thing is improv training has a relatively easy entry point. You don't need a lot of equipment or academic qualifications. You just need a group of people and someone who knows the basic premises of improv, and you can get started. VB: You'd probably be happier as a person as well. John Sweeney: So far, so good, for me! VB: In your creative funnel process, you perform a work in progress before a live audience and monitor and evaluate their reaction. This is a form of prototyping, to fail early in order to reduce the risk of a major failure with the finished production. You observe that many theatres no longer exist because they felt "their audience was wrong." Is that a key lesson for businesses as well? John Sweeney: The corporate examples are the ones filing for bankruptcy! I've got to say, there's perhaps a bit too much arrogance in that statement. A lot of highbrow theatres do important work, and will continue to do important work until their grant money runs out, or their customers abandon them. We come from the circus background Dudley taught us, and the entrepreneurial background the farm taught me. We know for sure that our product has to meet what our customers want. If we can't put something on stage that is worth $25, then we are going to be practicing our art form in our basements with each other for an audience. The lessons we've learned have had a large impact on me. There have been incredible changes in businesses in terms of exhibiting customer-centered behavior, and developing customer-focused cultures. Customers are influencing these changes. One of the greatest aspects of the Microsoft Corporation is their partner program. It's robust, listens, and enables the partners to help establish directions for the next version of the product – indeed the next version of the company. This is a wonderfully improvisational way to do business. VB: One of the six goals you identify for your book is "Make the top one hundred books banned by the Roman Catholic Church, perhaps right below Harry Potter." Why is that? John Sweeney: Why would I ever say that? Only an idiot would say such a thing! Did I really say that in the book? Perhaps it's explained by the fact we're always trying to be surprising in what we say and do. It was probably from a brainstorm idea. We strive to be disruptive! We wrote the book when Harry Potter was getting banned. We did an appropriate sketch in a show in Rockford, Illinois where the Bishop of Rockford had just gone off the deep end trying to make sure the book wasn't in any libraries or schools. We didn't mean literally that we hoped the book would be banned. We were trying to convey the fact that a lot of times it's tough though in hindsight people often are grateful when we stand in front of an organization and say, "Your culture is different from an improv scene. We talked to a hundred of your employees and they say they don't feel comfortable bringing forth their ideas." Those messages aren't always listened to with welcoming ears. VB: Were you born with a great sense of humor? John Sweeney: I think so – in some ways we all are. I was born 10 pounds 14 ½ ounces, and I believe my head size was exactly the same as it is today. So yes, maybe I was born with a sense of humor. I was being laughed at – I had to laugh as well. A sense of humor is required on a farm with 7 brothers and sisters, and I had grandparents from Ireland. Not to stereotype Irish people, but I believe Ireland's culture has a strong sense of the value of humor. The Irish have a long history of story telling and wit. I don't remember a day while I was growing up when there wasn't lots of laughter. There was a sense of mischievousness. There is nothing more rewarding in life than sticking it to your siblings, or finding a way to trick them. It was always in good fun, but in a competitive sense. As in a small Irish town, in our family we were always rewarded for being funny. Probably being a compassionate and generous person was highest on the priority list in our family, and right underneath was the understanding that if you're funny, it's good. Below that was the ability to make a dollar. Intelligence was 5th or 6th on the list, and hard work was also somewhere in that range. I guess I would have to say I was born with a great sense of humor; it's part of my DNA and value system. VB: I assume you also prefer to interact with people who have a sense of humor. John Sweeney: Yeah, and I'm attracted to funny people; I'm not attracted to people who don't laugh. VB: Why didn't the school system beat your sense of humor out of you? John Sweeney: I had an equal proportion of nuns who swung rulers at me, and others who filled me with confidence and love. The good ones we called "penguins," and the tough ones the "hooded marines." And there were priests at our school who told us we had lots of assets and power in our life. In grade school, high school, and college a lot of the clergy I interacted with were funny people. Four or five significant clergymen especially influenced me. I remember hundreds of speeches at church about the worship value of laughter, the ability to celebrate life, and laughter as a form of prayer. If you are the kind of person who believes there is a higher power, then laugh because laughter says, "I'm having a pretty good time in this life. Thanks a lot! This rocks!" Lots of wonderful priests and nuns helped me learn to laugh. VB: Do you ever secretly regret leaving your position as a commercial real estate consultant? John Sweeney: On balance not at all, but I do miss certain aspects of it. One of the biggest things I miss is that commercial real estate work demands a high level of competition where the goal is to be the best as an organization. I don't mean the arts don't have that motivation to be the best, but the arts are wonderfully endearing and we take care of each other. Some days I miss being around a team of people who are outwardly and aggressively saying, "We are going to be successful today," and "We are going to be the best corporate real estate firm on the planet." As artists at The Brave New Workshop we want to be the best we can possibly be. A lot of artists aim for this but perhaps they aren't as outwardly focused. I miss the kind of pressure and focus I had in the business world. I still feel it within myself, and there are some individuals in our organization who have this drive. I guess what I'm saying is everyone in the arts is so darned nice! I like it, but I also like to be pushed. I like to have a teammate who says, "You think you're going to be number one in selling? I'm going to sell harder and be more successful than you!" The path I took that got me to this place in life was completely unexpected. I didn't get a degree in marketing and spend 7 years in the corporate real estate world to prepare to be a professional improvisational actor, then an owner of a theatre, and subsequently a corporate keynote speaker. That wasn't in my strategic plan when I graduated in 1988! But I have no regrets. I can't imagine a luckier man. I can't imagine a different set of circumstances that could have led to where I am today. I am grateful for what's happened and where I am. VB: If you had stayed in real estate, could you have made lots of money and had as much fun as you have in theatre? John Sweeney: Absolutely not! Almost daily in the corporate world my sense of humor, style, or need to vocalize ranged from borderline to inappropriate. I think I would eventually have gotten fired! VB: Do people in business become adept at creativity and innovation if they hone their skills at improvisation? John Sweeney: Yeah, I think so. And people are encouraged to improvise the more it is nurtured and, most importantly, the more it is welcomed. It requires practice. In The Artist's Way Julia Cameron and Mark Bryan talk about how to replace creativity blocks with artistic confidence and productivity. It's somewhat a matter of self-perception. This leads me to one of the things I talk a lot about in the corporate environment. We should consider what skills we bring to work, leave at home, or perhaps use on weekends. We may be an artist, poet, songwriter, or musician – but we tend to not bring these or other creative skills with us to our work. Improvisation can help nurture, grow, and welcome the creative skills people have that are not directly related to their work. We tend to not consider how we can encourage employees to use all of their creative skills at work. I'm not suggesting that a manager in a consulting firm should encourage employees to play guitars in the hallways – but they should be encouraged to be their "whole selves." I'll give you an example. For about a year whenever I was in a new town I would park my car from about 6:30 to 8:00 am and from 4:00 to 6:00 pm in the parking lot of the largest company I could find. I watched about a quarter of a million people walk into and out of their office during that year. I had no idea what I was looking for – I just wanted to see if there were any observable patterns or consistencies. I drew 4 conclusions. People walk out of our office at twice the pace they walk into it. This doesn't make any sense, because after 8 hours of work we should be more tired than when we started. When they got to their vehicles they took the things they associated with their work – such a briefcase, stack of papers, or backpack – and put them as far away from their bodies as they could. They tossed them on the floor or the back seat. About 40% put them in the trunk, knowing that when they got home they were going to have to reopen the trunk to retrieve it. Not an efficient choice. The third thing they did was a costume change. They put on or took off a hat, removed their tie, took off their jacket, or put on a sweater. As part of this costume change it appeared they experienced a change of character. Then most of them turned the radio up loudly. I would walk along with some of the people getting into their cars so I could hear what type of station or music they listened to – it was completely random. People listened to public radio, talk radio, rock and roll, country, and jazz. The one thing in common was they all turned the volume up to about the same level. Perhaps it was to get some white noise in order to have a little mental vacation. All of this led me to believe that the people driving away from their offices were a different version of the human beings who had been inside working all day. As someone who is contracted to assist with culture change in large organizations this bothered me. I kept thinking the people driving away would go home and play with their kids, sing in church choirs, write poetry, or appreciate and perhaps do watercolor paintings – manifesting the creative, passionate, excited, and committed side we want in brainstorming sessions at work. The side we need for different breakthrough thinking in order to develop the next innovative product. We ask people to come up with innovative ideas, but we haven't engaged their innovative sides. I don't have all the answers, conclusions, recommendations or approaches, but those observations and thoughts still haunt me. A lot of us are different in our workplace than outside of the workplace. VB: After people attend some of your training sessions do they walk into their workplaces at the same speed as they walk out at the end of the day? John Sweeney: I hope so because it would be a symptom of a cultural change in an organization. It's not necessarily that people don't like their jobs, but it seems some don't feel that "all of themselves" is welcome at their workplaces. Either that, or they choose to not bring all of themselves and their full set of skills, abilities and energies with them. I hope that, if the simple 8 secrets, or some of the cultural aspects we use at The Brave New Workshop were to be implemented at our clients' organizations, someday the employees will drive up to their workplace and say, "Now here's a place where I can bring all of myself and, I'm going to run inside right now." The Brave New Workshop Comedy Theatre is a small, slightly freaky work environment, but I did the same study. I watched our employees on about 20 different days, and saw them walk into and leave the workplace at the same pace. As a matter of fact, they walked in a bit faster than they did when leaving because they were tired! The extent to which this is the case with employees in the organizations we work with, makes me feel that we are making a difference. VB: You and the Brave New Workshop have also published Return to Civility: A Speed of Laughter Project. What kind of person would we be if we followed all 365 civil suggestions in the book? John Sweeney: Well…there wouldn't be anybody like me, I can tell you that much! You should have seen the laughter of my brothers and sisters as they read it! They commented, "That's a bunch of great suggestions, John, why don't you read it!" Seriously, if people followed all the civil suggestions they would be a lot like my wife. They would be forward, open, expansive, and solution-oriented. They wouldn't be selfish. Part of the reason we wrote that book is due to what I have observed when I travel. I have traveled a great deal – especially until two or three years ago. If you want to see one of the least civil places in the world, hang out at the security line of any major airport and watch what happens when people are in a rush. Behaviors change from doing what's best for the world and for our team, to "I need to catch my flight and I will walk over the back of a 90 year old woman in order to get to it on time!" If people followed the civil suggestions I think they would become improvisers. When I'm on stage I do a lot of the things in that book. Philosophically I'm very civil and think, "What can I do to help?" But a lot of times, when I'm offstage, I'm tempted to revert to "What do I need? My needs are important. I'm in a rush. I don't have time to be considerate of other people." In that state of mind I break a lot of those civility suggestions. This is likely too broad and general a statement, but part of the challenge we face in being civil is the pace of the world. A lot of older people tend to follow the suggestions. My grandfather followed those civility ideas without thinking. He was a wonderfully civil person who wouldn't have been able to understand why everyone didn't follow them. For him it wasn't really a choice – it was almost instinctive to be that way. If we follow the civility suggestions perhaps we will grow to be wise and kind old people. And I hope it will help us avoid losing our memory or ability to walk without a cane! VB: In addition to being wise, we probably would be happy. John Sweeney: Yeah, it's the same as exercise. The more civil you are the better you feel. My wife is like that. There are days when I want to say to her, "Can you give me some of your happiness? Can I be just as civil and calm?" VB: Why did you feel it necessary or desirable to propose these civility suggestions? John Sweeney: We were at a concert in celebration of my wife's birthday, and many in the audience were being uncivil by talking while folksinger Shawn Colvin was performing. I was about to go nuts, stand up, and say "Would you people shut up!" when Jenni put her hand on my knee and said, "They're not meaning to be rude, they're forgetting to be civil." VB: Do you have any personal favorites among the 365? John Sweeney: I like the one about giving the peace sign instead of using your middle finger, because sometimes it accomplishes the same thing and you don't have to feel badly about it. I like the one about telling someone they have had a positive influence on your life – whether it's a teacher, coach, or other significant person. There was a long period in my life, maybe 10 or 15 years, when I was having a lot of fun but was like the classic adolescent teenagers who think they know everything. I was outspoken, and not a great listener. It wasn't until I was about 30 that I realized there were people who had taught me some wonderful things, and they were patient and supportive. The current Athletic Director at the University of Minnesota, Joe Maturi, was my Dean of Students in high school. He let me know the type of person I could be. I saw him the other day and let him know that as I raise my sons I hope I can do for them half of what he did for me. Living in Minnesota I like the suggestion that if you are cleaning the snow off your car, consider doing the same for the vehicles owned by a number of your neighbors. It would be a wonderful thing to come out of your house and see that your car had been all cleared of snow. This would be civil behavior. VB: You invite readers to email you their additional ideas for increasing civility in our world. Would you share a few of the suggestions you have received? John Sweeney: It seems the additional suggestions have emerged for the same reasons we chose the ones for the book – people have done something that has bothered or irritated the reader/submitter. We have received a considerable number about cellular phones ringing at inappropriate times and places. I can identify with this suggestion. When you're an actor on stage and in the middle of delivering a line it's one thing when a cell phone rings, but when the person carries on a disrupting conversation it's not only amazing, it is downright rude and irritating. In our theatre we let everyone know at the beginning of the show that if you take a call on your cell phone one of the actors onstage is going to come to your seat, take the phone out of your hand, and continue the conversation for you. The actor and the party on the other end of the line are going to have an interesting conversation. You're either going to lose your job or get divorced! We've received a lot of suggestions related to a lack of civility in politics. Can American voters, or politicians disagree and still be civil to each other? It relates to the wisdom behind the question my parents who, at the age of 83, ask, "When and how did we get to be a society where disagreement always equals anger or insults?" In my family I don't know if there's anything we ever agreed on – everyone had a different point of view. But we knew if we were going to live in the same house and get the cows milked we had to figure out how to disagree but do it in a way that we still knew we loved each other. I love those convenience stores and gas stations that have a sign "If you have a penny leave it, if you need a penny take the dish." It seems like a solution the world needs. If that were our perspective on the world's health, food distribution, or energy problems it would help us to collectively implement solutions. You've got some oil? Give it. You need some oil? Take it. Imagine if OPEC tried that approach! In the next 6 months I think we're going to set up a website where people can type in their address and get a civility book for free if they can't afford to buy one. If you can afford it or want books for your organization they'll be $5 each. If people have civility ideas, they'll be able to provide them and grant the rights to have them included in the next version of the book. There will never be any profits paid to anyone from the sale of the book; it will keep replenishing itself. I've done the math and it appears that if we put 10,000 books into the kitty it will have sustainability, will perpetuate, and replenish itself. Perhaps we could have a thermometer to let us know the sales and current inventory of books, because the more money we collect the more books we'll be able to print and give away to those in need. It would be similar to the perpetual penny dish in the convenience store. VB: How have you changed as a person over the years professionally and in your personal life as you embraced and learned how to improv? John Sweeney: I've changed due to a combination of getting older and my improv experience. It's an interesting dichotomy that with age we lose some of our passion and angst, and gain a little patience and wisdom. Some days when I'm tired but need to sell more I wish I had my youthful energy. The biggest thing improvisational behavior has taught me in the business world is that I have a strong point of view for our organization. I want to keep the theatre and improv school alive for as long as we can, maybe forever. And we want to take what we know and help other organizations. I want to accomplish this every single day. The circumstances of the scene in our theatre, each quarter's revenue, and our client list, are going to continue to change and they won't always be perfect. Before I learned to improvise well, and maybe before I was old enough to be patient, I would think if things weren't going perfectly it's bad and I should worry. I've learned that even in the fast art form of improvisation we can be patient; that the scene will work itself out. I love this theatre, honor Dudley Riggs, and want to have what improvisation has taught me benefit millions of people. Besides the love for my family, these are my first thoughts of the day, every single day. They give me the patience to know it's going to be okay. VB: Are your messages and methods making a "permanent" difference with the companies you work with? John Sweeney: Yeah, I think so. It depends on whether the companies hire us merely to be a hyped experience, in which case we arrive, generate a "Rah, rah, rah," and go away. This makes it hard to stimulate a lasting change. Another variable is whether or not the company already has some sustainable programs and tools promoting creativity and innovation. Do they have leaders who embrace these values and lead by example? I certainly can't say we make a permanent difference with every customer and organization, but in the ones where some or all of the above conditions exist we have a definite and positive impact. That's probably why, in our recent brand survey, we found that 100% of the customers surveyed responded they were 100% satisfied 100% of the time. The feedback we receive after working with a company can be very rewarding. One emailed us with the message "I don't know if you remember, but you spoke to our organization 3 years ago. You talked about the 8 Brave New Workshop secrets to world-class idea generation. I've tried to live by them, and they work." This type of feedback reinforces for me that this improvisation art form is bigger than a speech. It's bigger than a book. This way of life can have a big impact on an organization's health and profitability. VB: I've asked you a lot of questions. Is there anything that we didn't talk about that you had hoped we would? John Sweeney: I don't think so. I'm just tickled that you were interested. We have been interviewed by a lot of people, and it was so nice, judging by your questions, that you actually read the books! Sometimes people interviewing us ask questions that are so off base. So I would just like to thank you. I am really grateful, and I'm a fan of your newsletter and website. I was really hoping you would want to talk to us, because I think you do a wonderful job. To be associated with IdeaConnection, with the other people you talk to, and with you puts us in good company. We're a small company that is always trying to grow, so one of our things is to try to "hang out with cool kids," as we say. VB: It has been a delight talking to you. I was very much looking forward to it, and our conversation exceeded my greatest expectations. Congratulations on your two books, and I wish you continued success with The Brave New Workshop. It sounds like you are having a lot of fun! John Sweeney: I am, and I love what I'm doing. It's a lot of hours so it wouldn't be for everybody. But we love the fact we can make a difference in people's lives. John Sweeney says there is no magic that will make us more creative and innovative. In Innovation at the Speed of Laughter he advises that if we embrace the 8 secrets of the Brave New Workshop creativity, and use their innovative process we, and the people we work with, will "increase the potential and probability of finding the next great idea." Accepting All Ideas. Most individuals are more interested in having their ideas heard and respected than having them implemented." Deferring Judgment. This helps us unlearn the "automatic" response of focusing on what's wrong with an idea or what won't work. Sharing Focus and Accepting All Styles. Because the goal is to encourage everyone to be their most original and unique self, they must be allowed to participate in the idea generation process in their own way. Declarations. Declaring your point of view early and strongly at the beginning of a project adds significantly to the quality of the solution. Create a Statusless Environment. The comfort level, openness and productivity of a group increases if the perceived or actual status within a team can be flattened. Create a Reward System That Recognizes Innovation and Creative Risk-Taking. "People are more affected by their fear of creating the wrong idea than they are motivated by excitement and passion to create a truly innovative idea." Yes First! This says "yes" to the potential that exists within an idea, and enables it to fuel additional idea generation. Perceiving Change as Fuel. Perceive change as an "exciting exploration of what is next," rather than an interruption of what is reliable and consistent. Consider change as a vehicle of opportunity. Humor and laughter are infectious. John Sweeney's sense of humor, wit, and enthusiasm are improv. The next time any of our IdeaConnection readers are in Minneapolis, Minnesota they will want to check out improvisation and creativity at the Brave New Workshop Theatre. John Sweeney is an author, keynote speaker, trainer, improviser, comedic performer, and owner of the nation's oldest satirical comedy theatre, the Brave New Workshop. In 1993 his love for the art of improvisational theatre led him to leave a successful career in corporate real estate and become a full time actor and improviser. 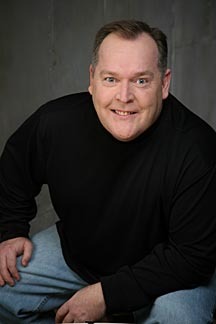 Sweeney performed hundreds of shows for Second City Communications in Chicago, then he became a full time actor at the Dudley Riggs Brave New Workshop Comedy Theatre. After buying the Brave New Workshop in 1997, Sweeney combined his instinct for business with his understanding of improvisation to launch the theatre's corporate services division as well as a speaking and training career. Since then he has trained and entertained thousands of business leaders in hundreds of companies using the Speed of Laughter programs. Sweeney's message and methods are based on the core belief that everyone has unlimited creativity and improvisational ability locked inside them, but rarely are they motivated to express that best self in the workplace. He humorously bridges the principles of improvisation to key business challenges. He helps individuals, teams, and leaders improve focus, engagement, and productivity in times of chaos, achieve greater innovation, and renew a feeling of enthusiasm for their workplace. John Sweeney led a team at the Brave New Workshop to write Innovation at the Speed of Laughter: 8 Secrets to World Class Idea Generation(2004) and Return to Civility: A Speed of Laughter Project (2009).